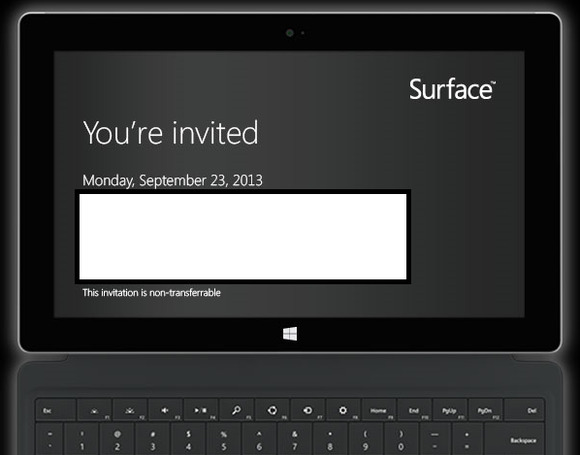 Microsoft has begun sending out invitations for what is almost certainly a next-generation Surface launch, most likely what is being called the Surface 2. Interestingly, the launch is being held in New York City, not Silicon Valley or Redmond. Microsoft hasn't said too much about what the announcement will entail, but we understand that it will not include a small-form-factor Surface tablet. Instead, the most likely product to be introduced is the Surface Pro, a refreshed Surface with a fourth-generation Intel "Haswell" Core i5 processor as well as an additional 4GB of RAM, for a total of 8GB. Reports from Neowin and WinSuperSite have said that those are all that the new tablets supposedly offer, except for a new kickstand with not one, but two positions. Pricing and availability have not been announced. Seperately, Nvidia has claimed it's working on a second-generation Surface RT tablet. Other reports claim that Microsoft will add a so-called Power Cover, a keyboard cover with an integrated battery that will increase the tablet weight by about a pound, to about three pounds or so. That's in addition to a separate Surface docking station that Microsoft reportedly plans to announce. Microsoft has struggled to sell both the Surface Pro and Surface RT, recording $863 million in revenue for the tablet during its last fiscal year. But Microsoft also wrote down the value of the device by $900 million, charged against its profits for discounting the Surface tablet at the end of August. Then, Microsoft permanently dropped the price of the Surface Pro with a $100 discount that prices the Surface at $799 for the 64GB version and $899 for 128GB. Microsoft also slashed the price of its standalone Touch Cover accessories by $40; regular covers now cost $80, and Limited Edition covers are $90. Pricing for the Type Cover, which has actual mechanical keys compared to the Touch Cover’s pressure-sensitive sensors, remains at $130. The Surface RT tablets also received their $150 discounts, to $349 for the 32GB version, and $449 for 64GB.